We've probably said it before. We'll probably say it again. But this article says it very well: Make your web site legible. 16 Pixels For Body Copy. Anything Less Is A Costly Mistake. Consider your audience. Gray-on-gray eight-pixel type is beautiful and looks like an architecture magazine. But if you want your audience to understand your message, larger and higher-contrast is the way to go. The article itself proves the point. "You have been redirected to http://XXXX/b2c/init.do?shop=GL-L0 in a new browser window. Please continue browsing the XXXX web site within this browser window." What you do not see is the technical information I needed, which means, were I a designer, they would have lost the sale. Why not? Because I use a pop-up blocker when I surf the net. The customer service rep recommended I turn the blocker off to browse their site. Yeah; right. Let me turn off my virus protection while I'm at it. Here's the problem: pop-up ads are a type of spam. Not legally, yet, but in terms of how they effect the web browsing experience, and how people react to them. They are also among the easiest types of spam to block; websites usually need to ask permission to open a new window, and pop-up blockers are set to always respond "no". Not everyone uses pop-up blockers, but the number that do is steadily growing. More importantly, most, if not all, early adopters use them. In other words, the people most likely to be searching for non-established, high-performance new building products. 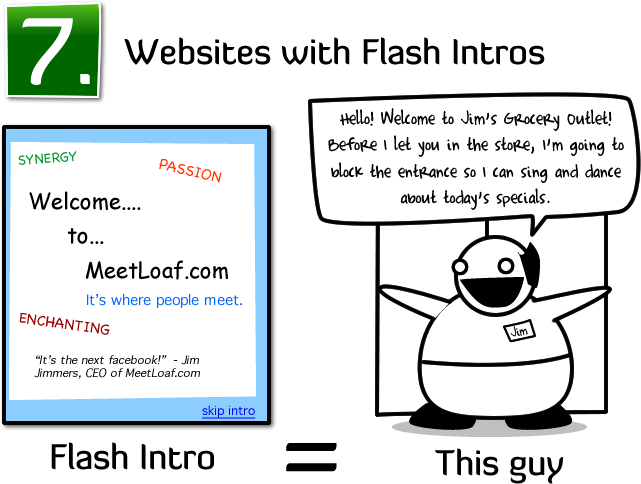 This is the same problem I have with Flash intros to websites; why are you putting a potential technological barrier between your customer and your product? The advantage to using a pop-up is site visitors can access new resources without using their place on the current page. This is most useful when the new resource exists outside of your site. For example, if I wanted to show you something on the Concrete Decor Show & Spring Training blog I would set it to open in a new window because I want to share their site but do not want you to leave mine. This lighting company's use of pop-ups does not make sense, because the technical information is still within their website. Pop-ups are one of those design tools that currently live in a grey area. Using them is not "wrong", but they are annoying enough, poorly used, that it almost does not matter. If you feel your website benefits from using pop-ups sparingly, use them. But never hide important information behind one. That about sums it up. Would you put any impediment outside the door to your store, especially a loud, obnoxious one? Of course not. The only businesses I can think of that do this are car dealerships, furniture stores, and places having "Going Out Of Business Sales". And even then you are not required to interact with the guy dressed like Uncle Sam on stilts; he's just an attention-getting device. Even worse are the cases where if this guy's not there, because he's on break or something, you can't get in at all. Most people won't spend time looking for an alternate entrance; they just leave and may never return.